I kicked off the 2011-12 col­lege sports sea­son on Sep­tem­ber 3 at Macalester Col­lege in St. Paul, Min­neso­ta where the Grin­nell Pi­o­neers came to vis­it the Scots. It was an over­cast day and rain passed just north, but it stayed nice­ly dry on this stretch of Snelling Av­enue. Macalester quar­ter­back Clark Bled­soe hands off to T. Joe Loiselle dur­ing a game be­tween the Scots and the Grin­nell Pi­o­neers on Sep­tem­ber 3, 2011 in St. Paul, Min­neso­ta. 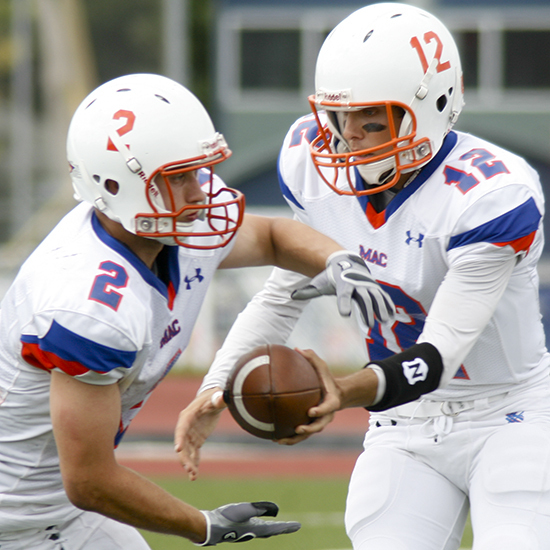 Grin­nell de­feat­ed Macalester 31–6. 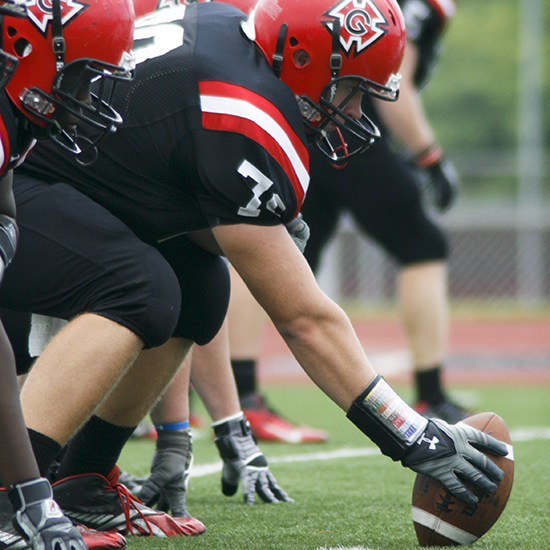 Loiselle gained 48 yards on the day. Grin­nell cen­ter Quinn Rosen­thal pre­pares to snap the ball in a game be­tween the Pi­o­neers and the host Macalester Scots on Sep­tem­ber 3, 2011 in St. Paul, Min­neso­ta. The Pi­o­neers de­feat­ed the Scots 31–6. 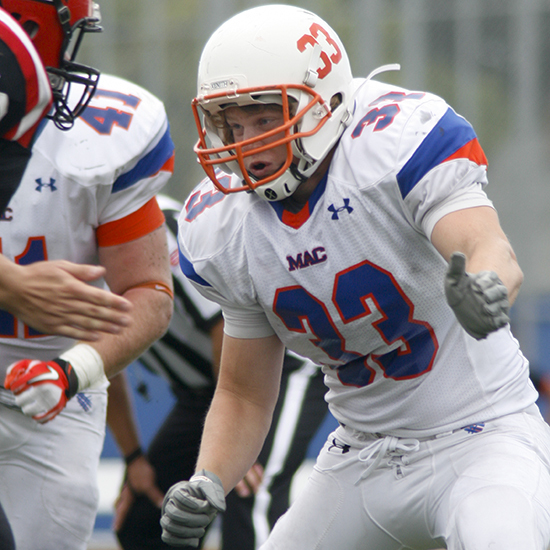 Macalester line­backer Levi Brown pre­pares to tack­le a Grin­nel play­er dur­ing a game be­tween the two schools on Sep­tem­ber 3, 2011. Grin­nell de­feat­ed the host Scots 31–6, in St. Paul. Grin­nell wide re­ceiv­er Cody We­ber cel­e­brates his touch­down re­cep­tion dur­ing a game be­tween the Pi­o­neers and the host Macalester Scots on Sep­tem­ber 3, 2011. We­ber had 5 catch­es for 43 yards. Lo­gan Granera, the Grin­nell wide re­ceiv­er, who also han­dles kick­ing and punt­ing du­ties, take a point af­ter at­tempt dur­ing a game against the host Macalester Scots on Sep­tem­ber 3, 2011. Granera had sev­en catch­es for 83 yards and a touch­down, adding a field goal in the sec­ond quar­ter as well as four P.A.T. in the sec­ond half. 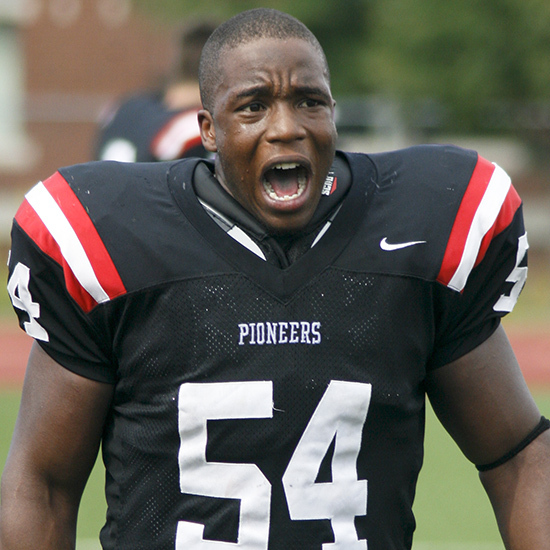 Grin­nell line­backer Je­re­my Wiles fires up the Pi­o­neers side­line in the sec­ond half of a game against the host Macalester Scots. 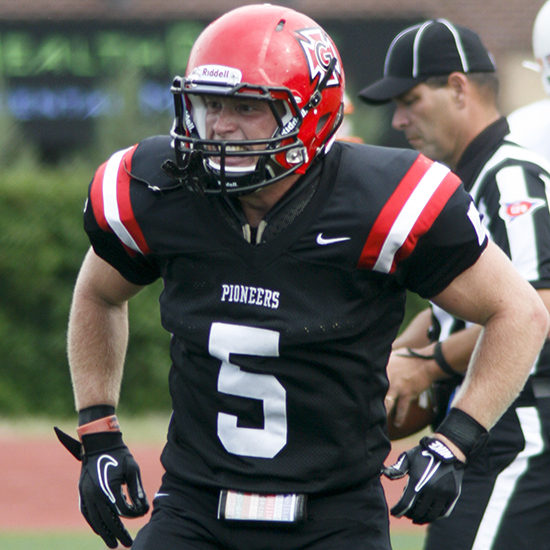 The Pi­o­neers won 31–6 while Wiles had two solo tack­les and two as­sists. You may be ask­ing why these are all cropped square and the rea­son is that when I first processed these the port­fo­lio show I was go­ing to be in was think­ing of do­ing a square crop theme and and I want­ed to try to ap­ply that to sports.